Cognitive dissonance: simultaneously holding two or more conflicting ideas, beliefs or values. For example I’m upset that this cool cloudy weather is messing with my afternoon ice cream plans, but at the same time I’m super excited to wear my new sweaters. Maybe that’s not the best psychological example, but it’s been over 10 years since I set foot in a psych class and this is how I understand the concept now. The idea applies to more than just sweaters for me. I want to eat nothing but fresh fruits and vegetables from the Summer harvest, but at the same time I’m craving roast meets with warm comforting spices. Cognitive dissonance is an uncomfortable feeling and people tend to find ways to resolve it. For example by roasting chicken flavoured with warm and comforting spices and topping it with fresh fruit salsa. Mix all the ingredients in a medium bowl. Let the salsa sit for a while for the flavours to blend. Pat the chicken dry with paper towels. Season all sides with salt and pepper and place in a roasting pan. In a small bowl mix all the remaining ingredients together. Brush the spice mixture onto the chicken. Bake the chicken, uncovered for 35 to 40 minutes, until the juices run clear and it is no longer pink inside. 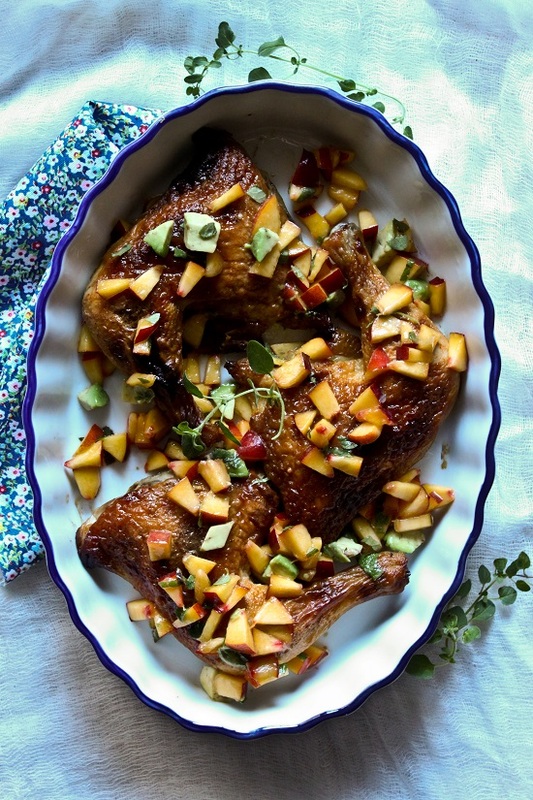 Transfer cooked chicken to serving plate and top with nectarine salsa. Absolutely elegant recipe. Beautiful photo too!